Garlic Chicken is a popular Chinese recipe. 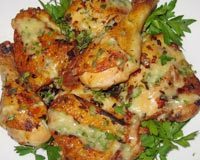 Learn how to make/prepare Garlic Chicken by following this easy recipe. Cut the chicken into bite-sized pieces. Melt the butter in a pan and add the olive oil. Add the chopped onions and cook gently until it turns soft and golden. Add the chicken pieces to the onion and garlic mixture and cook, till it turns brown on all sides. Add the chicken broth, season with salt and pepper to taste and add the chopped parsley. Heat till it boils then turn the heat down to minimum and leave it uncovered for about 20 minutes. Remove the chicken pieces and keep warm. Turn on the heat and reduce the liquid by about half. Remove from the heat and stir in the yoghurt. Serve the garlic chicken with mashed potato. quite easy to do and really tasty. I amended the recipe slightly and used more garlic, added coriander with the parsley and omitted the yoghurt at the end. Would definitely do this again and thanks to whoever uploaded it! Amazing reipe. Never thought, dish can be so relishing without any garam masala - just garlic, salt and pepper can make such a wonderful dish.